I have a new potting table! It started out life like this. A little rough (to say the least). Very, very rough. 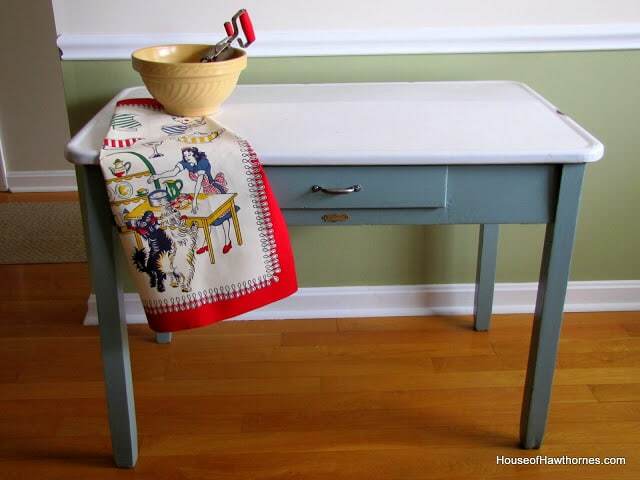 But when I showed you how to restore a vintage enamel top table it came out looking like this. Well, a couple weeks ago I still had not moved it out of my kitchen down to the family room where it was going to live. And I needed to pot up some flowers. So, I put one and one together and decided to move it outside temporarily to use as a potting table. And I love it out here! It’s actually been quite useful outside, because when it’s not doing potting table duties it can work as a small dining table. I found the small metal trashcan online and it’s great for storing my potting soil. And this is a Pepsi crate that I bought at an estate sale for $3.00. It’s being repurposed into a gardening tool caddy (we’re a Coke family here, so I didn’t feel too bad in putting the Pepsi crate outside and making it work for a living). So if you’ve always wanted a potting table or potting bench, but haven’t wanted to DIY a whole thing with power saws and all that. And didn’t want to spend the money on buying one pre-made . . . maybe make one out of something you have around the house. You just really need a sturdy table to get you going in the right direction after all. EDITED TO ADD: Some people have asked me about this plant. It’s a coleus. The place where I bought it didn’t have too much info on the tag other than “coleus”, but I think it is a Kong variety, which generally have huge leaves and taller plants. 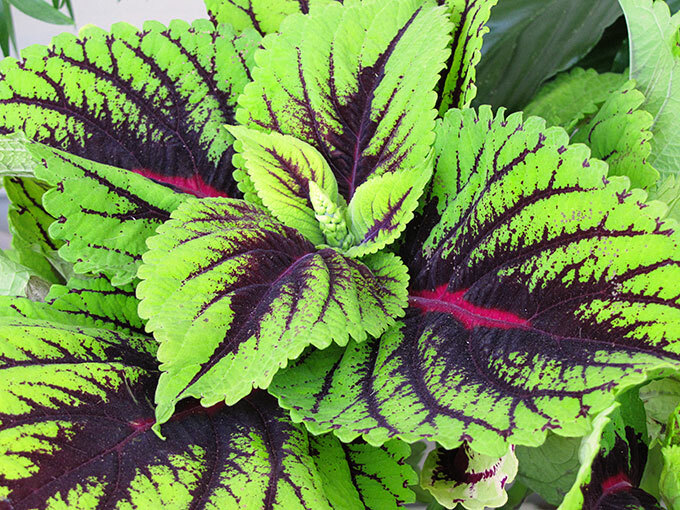 They do well when they get just a little early morning or late afternoon sun, although some coleus love the sun. The other thing people are asking is about the small metal trashcan – you can find them on Amazon HERE. 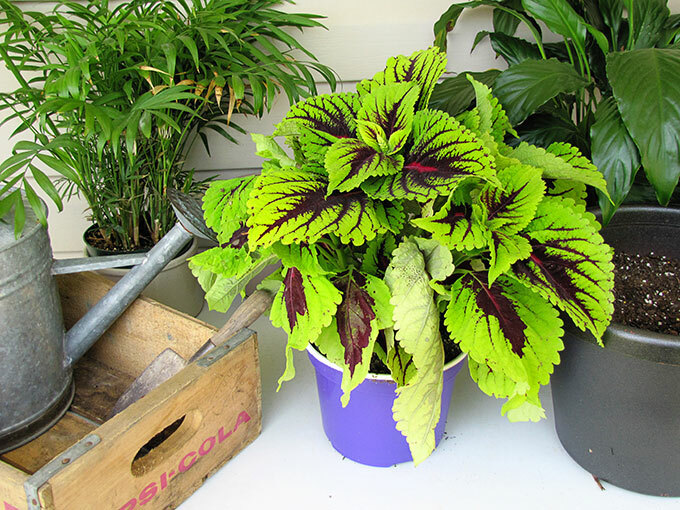 And coleus plants/seeds can be found HERE. Hah, I am a coke person as well. Check out the post I just posted, it has a Coke crate. I just found your blog and am now a follower. Great photos, great finds! Stop by and say hi! What a beautiful little table. I love the before and after pictures…I just love the blue and white! I have a thing for tables. Your table is simply divine. Nicely done. Pam – I am the same way with plants. I am trying to not buy so many this year..I really need to work on our front garden area before I do anything else. Beautiful! The table looks great out there. It makes an ideal potting table. Great thinking! Hi. Thanks for stopping by. I planted the impatients in the coke crate. I put a plastic bag down on the bottom. I had to make sure everything didn’t run out the handles, hah. I just planted it two days ago. Hopefully it will fill out. And can I ever relate to you. I can’t stop buying plants either. And don’t get me started if a garage sale has perennials that they divided for sale. Too cute!!! I love coke too but I couldn’t pass a good deal on a crate up! It looks great, great photos too! 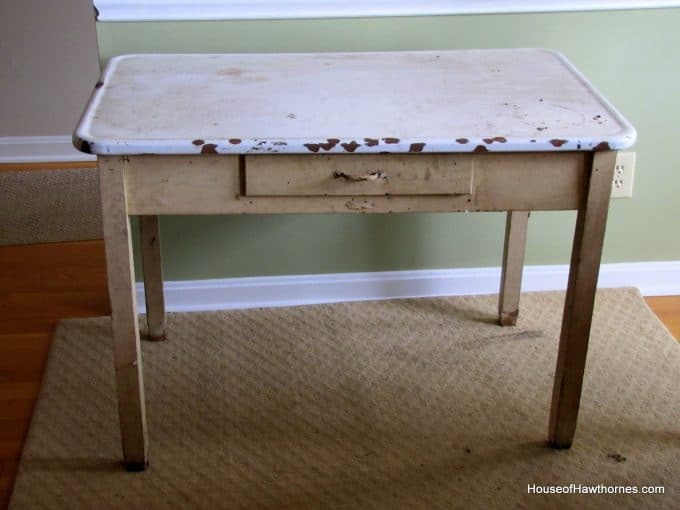 I think it is meant to be a potting table. 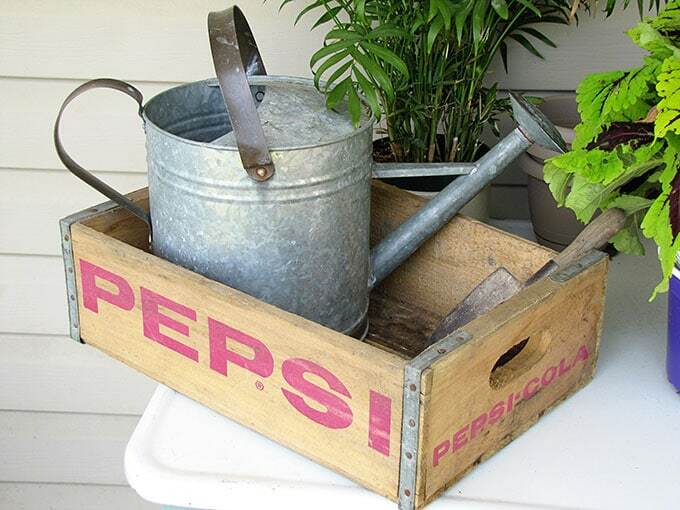 It looks great out there with your new plants and the Pepsi crate. That is one cute table. I just love her. 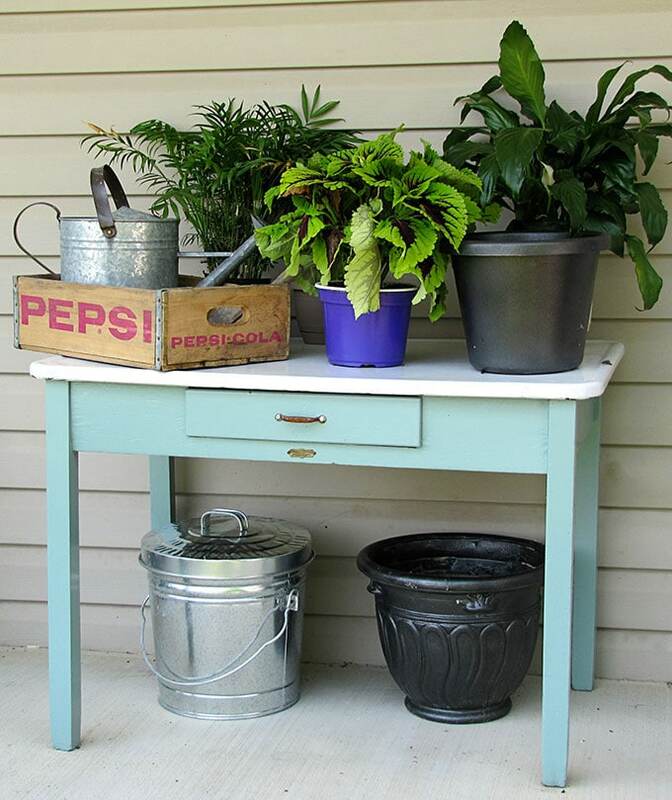 great idea as a potting table!! I am looking for one too. I have a little potting shed and I think a table next to it would be so cute. So many projects…so little time. Have a wonderful day. That is an amazing transformation on the top. You can’t see any signs of damage or wear. Wonderful choice of color. I am sure the drawer also comes in handy to keep tools close at hand. It looks great outside as a potting table Pam! 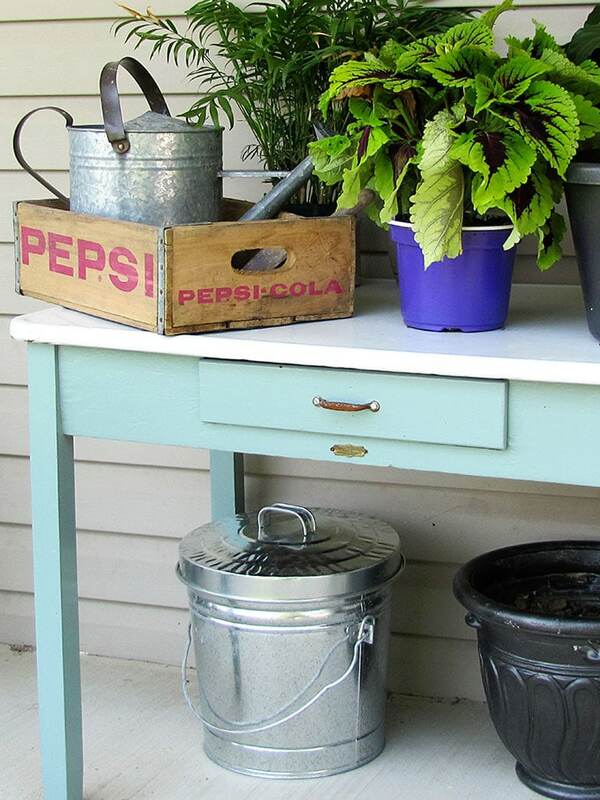 I love the Pepsi crate and coleus are so pretty, one of my favorite. Love it! Everything looks just beautiful. You have such a nice flair! What an awesome lookinng makeover you did on that table and I have the same problem with buyings plants…just so hard to stop:) Thanks so much for coming by my party. i love that you have a bowl of door hardware, lol, that is cracking me up. that…thingamajig is very interesting! your flowers and porch look great-and i’m a coke gal, too. cherry coke zero, oh you better believe it!